Seacoast United's Residential Soccer Camp at Brewster Academy will bring SUSC's top full time and part time coaches, as well as extremely experienced international staff to Brewster's beautiful campus on Lake Winnipesaukee in Wolfeboro, NH. During the week, daily sessions will cover various topics including speed & agility, technical skill and tactical sessions as well as small and full-sided match play. Seacoast United residential camps not only develop a player's soccer ability, but also help develop their independence, social skills, and leadership characteristics. Each afternoon, campers will have a chance to relax and utilize Brewster Academy's state of the art amenities including access to their own beach. Between sessions and each evening, players can enjoy the dorm common areas, visit the camp store, or even watch a movie at one of Brewster's auditoriums. "Thank you for a wonderful week at Brewster for James. He had a fantastic time, and truly enjoyed his experience. He loved being part of the high school team, made new friends and connected with his coaches extremely well. 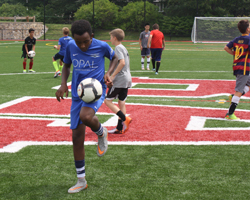 The camp was well organized and all of the events, playing and building skills for soccer, and dorm time were perfect for the week that they spent with the organization. He looks forward to the camp every year and is never disappointed." -Stephanie M.
"Colby had a wonderful experience at Brewster Residential camp! Thank you to everyone involved! Definitely on his list to come back next summer!" -Lisa E.
"Zoe had an amazing week and gained a ton of confidence! Thank you for helping us get her into the camp and thank you for running a camp that was both fun and challenging. Your efforts are much appreciated!" -Jason W.
"A quick note... My son Nathan had the best time at Seacoast United's residential camp. 'Best camp ever mom, I can't explain how great it was!'" -Victoria P.
REGISTRATION: Register online for the 2019 Brewster Academy Residential Camp by clicking here. About Brewster Academy's facilities: Brewster boasts a 50,000 square foot athletic and wellness center with a turf surface, a 200-meter track, fitness center, trainer's room, and a rowing tank, - all indoors. Outdoors, the school has six meticulously groomed athletic fields (all with expansive views of the lake and mountains), nine tennis courts, and the Pinckney Boathouse (home to Brewster's crew and sailing teams). For more information on Brewster Academy please visit www.brewsteracademy.org.